Meshuggah confirmed for Brutal Assault 2019! 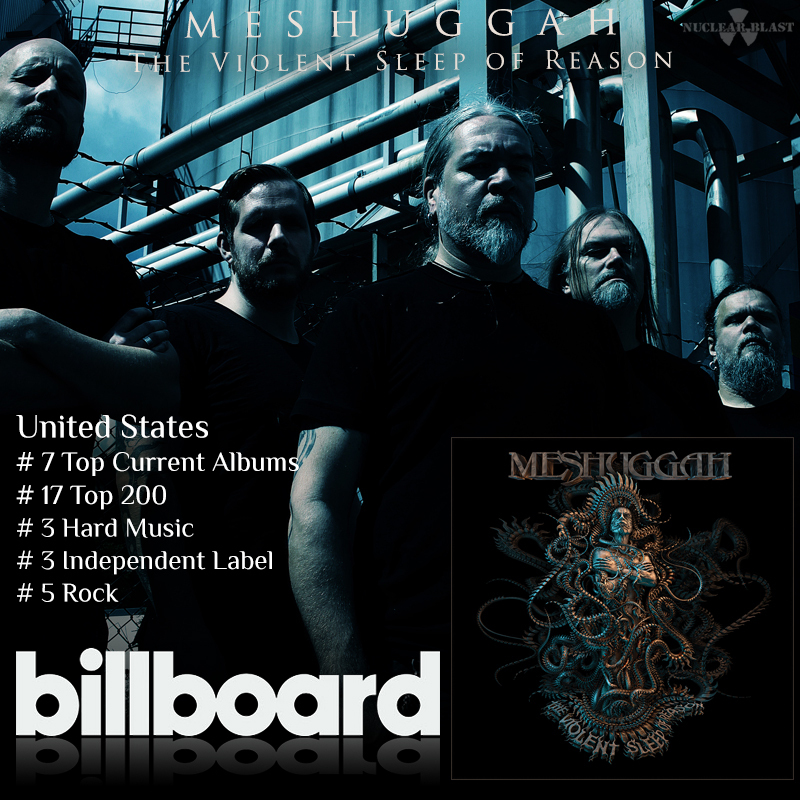 Meshuggah's eighth studio album, The Violent Sleep of Reason, was released on October 7, 2016 and saw its highest first week sales in the U.S. landing the band at #7 on the Billboard Top Current Albums chart, #17 on the Billboard Top 200, #3 Hard Music, #3 Independent Label and #5 on the Rock chart. The album also reached the #19 spot on the World Top 50 Chart. "A huge thanks to all our fans for the support and for buying the album," comments MESHUGGAH. MESHUGGAH release their eighth studio album, The Violent Sleep Of Reason. In celebration of the new album, the band release a music video for "Clockworks" (produced by Julius Horsthuis) which can be viewed now on YouTube. Purchase, download and stream the new album at http://meshuggah.net/stores. Meshuggah featured on the November cover of Decibel Magazine! MESHUGGAH will release their eighth album, The Violent Sleep Of Reason on October 7th via Nuclear Blast Records. Today, the band releases the 360 lyric video of the song "Nostrum." MESHUGGAH will release their eighth album, The Violent Sleep Of Reason on October 7th via Nuclear Blast Records. Today, the band premieres their first single "Born In Dissonance" and an exclusive interview with Tomas Haake on rollingstone.com. The Swedish extreme tech-metal pioneers MESHUGGAH have revealed the title of their upcoming eighth album, The Violent Sleep Of Reason. Inspired by a Goya painting called, "The Sleep Of Reason Produces Monsters," the album will be released on October 7th via Nuclear Blast Records. Pre-order The Violent Sleep Of Reason in the format of your choice here. Or digitally on iTunes, Amazon Music and Google Play. MESHUGGAH have announced their epic North American Fall 2016 tour. The trek will kick-off at the House Of Blues in Lake Buena Vista, Florida on October 10th, visit 2 Canadian cities as well as Knotfest Mexico before concluding in Maryland at The Fillmore on November 6th. Joining the band as special guests is none other than US metallers HIGH ON FIRE! MESHUGGAH will be supporting the release of their upcoming eighth studio album, The Violent Sleep of Reason. Watch a tour teaser on YouTube. MESHUGGAH at the AFTERSHOCK FESTIVAL October 22nd! MESHUGGAH at ROCKOUT FEST in Santiago, Chile September 3rd! Tickets for the initial batch of the European tour dates with High on Fire are on sale as of today!